Step 1 To make the dukkah, toast the pistachios in a dry frying pan over medium heat, stirring occasionally, for 2 minutes. Transfer them to a plate to cool. Repeat with the sesame seeds, cooking them for 1 minute, then the coriander and cumin seeds, cooking them for 1 minute, until fragrant. When the nuts and seeds are completely cool, coarsely grind using a spice grinder, clean coffee grinder or mortar and pestle. Step 2 Place the asparagus in a heatproof bowl. Cover with boiling water and stand for 2 minutes, then drain and pat dry with paper towel. Step 3 Put the eggs in a saucepan, cover with cold water and bring to a boil over high heat. As soon as the water boils, time the eggs to cook for 3 minutes. Drain the water from the pan and leave the eggs to cool slightly. Step 4 Place the eggs in egg cups and slice off the tops. 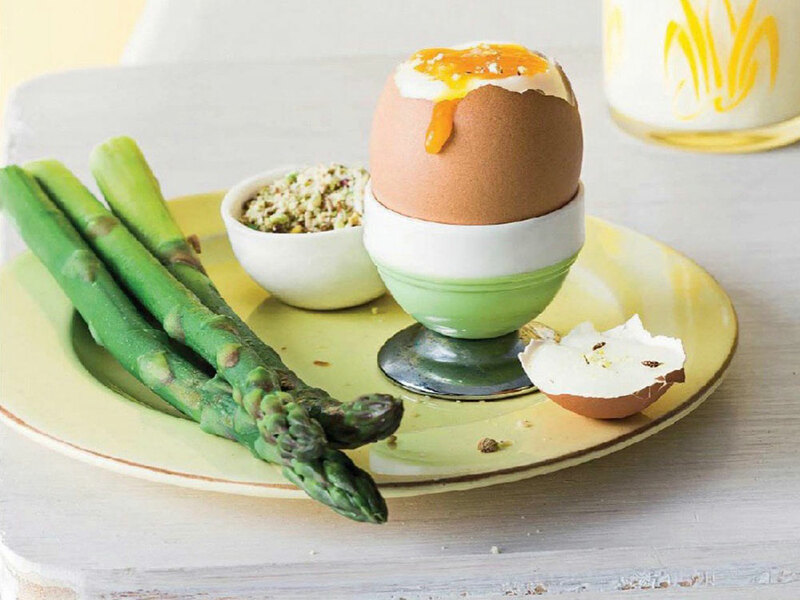 Serve with the asparagus spears for dipping, and 1 teaspon of the dukkah each for sprinkling. Check if your eggs are fresh by gently lowering the raw eggs in a saucepan of cold water. Fresh eggs will sink to the bottom; stale eggs will float to the top and should be discarded. Dukkah is an Egyptian nut and spice mixture that can be sprinkled over vegetables or used as a dip. The nuts and spices vary, so feel free to experiment to make your own version.